Winter Solstice Festival that usually falls around 22 December is here again. My Mother-in-Law, who normally is in charge of making glutinous rice balls (tangyuan or ronde) for the family to celebrate this festival, is in Sarawak for his nephew's wedding this weekend. This said, I thought of making some tangyuan for my husband and Father-in-Law instead. The tangyuan that I made today was the very basic ones without any filling because I didn't have much time to do any fancy tangyuan and to be honest, do not know how to make the peanut or black sesame paste filling. I quickly did the dough, cooked the tangyuan and made the sweet ginger syrup when Naomi took her afternoon nap. I made plain white and pink tangyuan just like how my late Grandma and aunt in Indonesia used to make them during this festival every single year. It was indeed very nostalgic for me to make these classic tangyuan for the first time today because as I made the dough, I remembered how my sister and I always asked to be involved when my dear late Grandma and aunt started rolling tangyuan during this festival. Also, I made the first two tangyuan in big size before making the small ones because my late Grandma and aunt believed that we ought to make the big ones (to symbolize the Mother or the Head or something like that) first when we start rolling the glutinous rice balls. By the way, my late Grandma and aunt usually also made big tangyuan with sweet peanut and dried mandarin orange skin pieces filling, my favourite! I do miss eating them. My very first DIY tangyuan. Here's the basic recipe of tangyuan I used today. In a large bowl, pour the glutinous rice flour and sugar. Add the vanilla essence, if using. Slowly pour the boiling water onto the flour mixture and mix it well with the flour by using spatula or wooden spoon. Using boiling water for the tangyuan dough will result in springy texture of glutinous rice balls. Once the mixture is not that hot, use your hands to knead the dough until it is not sticky to the bowl and your hands. Gradually add more glutinous flour, if needed. Split the dough into two. Add food colouring to the other dough and knead until it is incorporated. Roll each dough into a log and make small balls evenly. Place the small balls in a plate or tray that are coated with some glutinous flour so they don't stick to each other. Bring a pot of water into boil and pour the tangyuan onto it. Cook the tangyuan for few minutes until they float. Once they are floating and cooked through, strain them and put them in a bowl of cold water. Set aside. In another pan, make the sweet ginger syrup by bringing water, ginger slices, pandan leaves to boil. Add liberal amount of brown sugar and granulated sugar into the boiling water until you achieve the desired sweetness and all the sugar is melted. To serve, place some tangyuan on a bowl (do not include the cold water used to soak tangyuan) and pour some hot ginger syrup onto the glutinous rice balls or you may want to boil the tangyuan together with the ginger syrup for 1-2 minutes before serving. Serve hot. These glutinous rice balls and the ginger syrup are easy to make. If you'd like to make larger portion, just double the ingredients up. As an Indonesian, my favourite food or the kind of food that I can totally eat every single day is indeed Indonesian food. The only type of food that makes me feel at home, to be honest. When I first came to Malaysia three years ago, there was no authentic Indonesian Ayam Penyet restaurant available such as Ayam Penyet API in the city where I reside, Seremban. Every time I had the urge to eat something spicy, particularly cooked in Indonesian style; I always begged my husband to drive and accompany me all the way to Kuala Lumpur to just eat our Indonesisan lunch or dinner. Ah, those days.... Nowadays, things has gotten better as Seremban has a couple of Indonesian Ayam Penyet restaurants in town. But wait... Have you ever experienced some days when you are very hungry, happen to be not cooking, Mom is out of town (hence, no proper food at home), run out of fresh ingredients in the fridge, very lazy to go out because say it's pouring outside, don't feel like eating instant noodles again and again or bored ordering the same old fast food delivery? What if when one or some of the above situations happen and suddenly you are told that "Hey, you can have your favourite food from top restaurants in Malaysia delivered right to your doorsteps with just few clicks"? Well, in this case perhaps some Ayam Penyet, Bakso Penyet and hot steamed rice delivered to my house... Ah-mah-zing right? 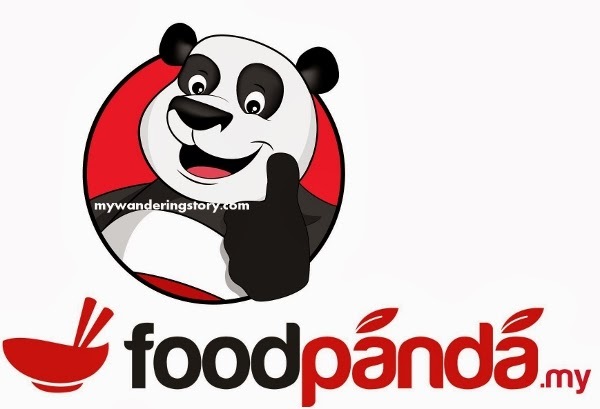 Well, the above-mentioned best-scenario of having your favourite food from famous restaurants in Malaysia delivered to your house is now possible with Foodpanda. Foodpanda is a food delivery service portal where you can place your food order from various top restaurants in Malaysia online! Participating restaurants/merchants include Old Town, Chatime, Sushi King, Sakae Sushi, Secret Recipe, Dome, Starbucks, Kenny Rogers Roasters, Pappa Rich, Ayam Penyet API and many more! Interesting, isn't it? Also, imagine some cold bubble teas delivered to your house on a hot Saturday... Heaven on earth at home! Some of the participating merchants.. familiar with most of them? So, how this thing works? First, go to Foodpanda's website or just click the Foodpanda's very eye-and-tummy-catching banner ads in my blog to start. Enter your location and you will be presented with a list of best restaurants in your neighbourhood from which you can order food online. Then choose the restaurant that you like and click their menu. Next, click the dishes that you wish to be delivered to you. Once done with your menu selection, fill in your personal details or create an account if you haven't to proceed with your food order online. The final stage would be choosing your preferred delivery time and payment method for your food delivery. And ta-da your favorite food for your hungry stomach is already in-the-making and soon will be sent to your house. So, friends in Kuala Lumpur, JB, Melacca, Penang and other places in Malaysia - if you got no time to cook for you or your family, too lazy to buy food outside or not in the mood to eat out, fret not! Just make your lunch or dinner orders with a few clicks and a short while later, your fave food will arrive fresh and tasty to your doorstep or even to your office! Ordering food has surely never been so easy and convenient like this, hasn't it? Share this post link to your Facebook wall, Twitter or other social media platform. Make sure your post is public so we can view it. Leave a blog comment below this post stating your name, email address and the city where you live in Malaysia. The RM20 vouchers' code will be sent to these 5 readers' respective email addresses so make sure you type your email address correctly. These vouchers are for you to use within 1 year with a minimum purchase of RM50. You can use the promotion voucher yourself or give it to your family, friends, colleagues or whoever dear to you, if you wish to! Remember, this giveaway is on first come, first serve basis - so hurry! It's been forever ago that I promised my husband I would make him his favourite chicken pot pies. Due to a million things that happened in my life all these years, including laziness, finally today I made some mini chicken pot pies for my husband and myself. The pie's filling recipe that I used today was based around this source and I made the crust recipe by using Martha Stewart's pie crust recipe. She used food processor for making the crust dough but I don't have one. Hence, I just used my fingers to combine everything but it eventually came out pretty okay.. though the final result of the pie crust is more like the crumbly egg tart or fruit pie's crust. My husband said my chicken pot pies were delicious but perhaps needed more pepper for the filling. My very first mini chicken pot pie. Here's more details of the recipe I used for making my mini chicken pot pies today. To make the pie crust: Sift flour, sugar and salt in a large bowl. Combine the flour mixture with butter by hand or by using food processor. Add some cold water to the mixture until the dough is crumbly but holds together. Form dough into a disk and wrap tightly in a plastic. Refrigerate first. To make the filling: In a pan, melt the butter and sauté the onion and garlic until fragrant. Stir in the chicken breast, carrot, potato cubes and mushroom for few minutes. Stir in the flour until well combined. Slowly pour the milk, chicken stock, a dash of salt, sugar and pepper into the mixture. Continue stirring until everything looks thick and smooth. Once the mixture is thickened, it's done - set aside. On a floured work surface, roll out the crust dough and make several round shape dough with measurement that would roughly fit your muffin cups. I used a mug to uniform the round shape dough for my pie. Once done, carefully place and press the round dough in each muffin cups. Fill each cup with a large scoop of the filing. Top each pie with the round dough and crimp them together. Brush the pie tops with some egg wash and make some holes on the pies' tops with forks for the steam. Bake the pies in the oven for 30-45 minutes or until they come out golden brown. There are indeed quite a bit of steps involved in making these mini chicken pot pies but they are relatively easy to make. I would, however, use the ready-made pastry sheets for the crust if I were to make chicken pot pies again in the near future. I personally like the taste and texture of pastry for savoury pies better plus they are not that messy/crumbly when cut or eaten. Enjoy this comfort food classic! On Saturday afternoon, the three of us attended a friend's son's second birthday party in Kuala Lumpur. It was one enjoyable kid's birthday party I've ever attended thus far. I loved the birthday party venue (very cute! ), the awesome super diabetic Smurf-themed dessert table and the sumptuous lunch buffet spread (call me crazy but I cannot stop thinking about the pasta and black pepper chicken breast from yesterday's party until this very moment!). Moving on, seemingly, it was not only me who took delights in eating the food at the birthday party yesterday. I am quite sure that my little tyke had a great time snatching and gnawing on all the food on Mom and Dad's plates as well. She only showed us her "Blah" expression when she tasted the satay sauce. My husband and I told and tried to make her not to touch the satays many times but she insisted so yeah... now she knows why we tried to stop her from eating certain food. Also, Naomi could not stop munching the various small biscuits as Mom and Dad checked out the sweet and festive smurftastic dessert table at the party. Below is Naomi's comic based on the smurfing awe-spiring birthday party she attended yesterday. Issue #7: Naomi and her sugar tooth. Finally, here are some pics of us taken at yesterday's birthday party. Trying to take one good picture with my daughter but it's not easy. That's all about our Smurfday in Kuala Lumpur yesterday. Since Naomi fell ill about 10 days ago, although she is relatively healthy now, she has not been drinking her formula milk again. I've tried giving her milk a little bit almost every day but she always pushes her milk bottle away and refuses to take some gulps. "Why you no like? Milk tastes no good?" Therefore, with Naomi not drinking her milk for the time being, I have to scratch my head to substitute her daily milk intake with something else. On top of the 3 x heavy meals, small fruit serving, rice rusk/biscuit and white bread that she consumes daily - I came up with the idea of offering Naomi the infant cereal (which contains milk) that she used to eat occasionally since she was a 6 m/0 ++ baby. This time around, instead of just mixing the cereal with hot water, I added oatmeal into it for some extra goodness, both nutrition and texture wise. Lately, I've tried cooking the oatmeal with formula milk a few times but Naomi didn't really fancy eating it like before and left me with quite a bit of cereal leftover in her bowl which I frowned upon. The infant cereal that I chose for Naomi is Brown Rice cereal. Apparently the slightly sweet and delicious Brown Rice cereal is really all-time baby's favourite and I reckon its taste is totally designed to appeal to any baby's palate (I've tried most of the infant cereal variants in the supermarket shelf, ate each of them a bit and Naomi and I love this one best!). Here's how I prepare the Brown Rice and Oatmeal Cereal for my girl. Put all of the ingredients in a small pan and mix well with a spoon. Bring the mixture into boil on small fire whilst whisking constantly. Cook the cereal until the oatmeal is soft. Serve the cereal when it is not too hot. I feed Naomi with this cereal about twice a day. Thus far, she loves eating it and always finishes the cereal that I prepare for her. Since normally Naomi drinks her milk before bed time and her last rice dinner is around 6-8pm - this means, with the absence of her milk feeds at night, I have to purposely go to the kitchen late at night to cook this cereal and spend extra 15 minutes downstairs to feed her. When Naomi is really hungry again by midnight and is not sleeping yet, I let her snack on some white bread which nowadays is a permanent resident in my bed room. My cheeky baby is back! Anyway, Naomi is doing fairly happy and healthy again now and I am slowly trying to make her chubbiness back to its rightful place!